But how much are they offering? Uncertainty about an acquisition, plus turmoil in the stock market, could let investors buy Middleby at a nice price. Oven maker Middleby announced an important acquisition in mid-July. Since then, its shares have only gotten cheaper. MIDD data by YCharts. 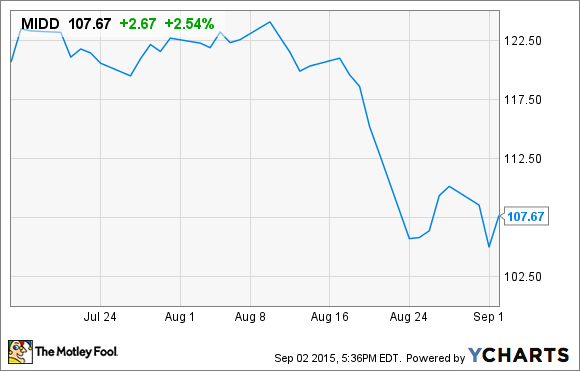 On Tuesday, Sept. 1, Whirlpool (NYSE:WHR) stuck its nose in where it did not belong. At least, that's probably the way that Middleby (NASDAQ:MIDD) sees it. About six weeks ago, Middleby -- the little oven maker that could (double its stock, that is, and then double it again) -- announced plans to acquire high-end English oven maker Aga Rangemaster for a $200 million purchase price. The deal's price looked very attractive to Middleby shareholders. Aga would sell its shares for about 0.5 times annual sales -- a mere fraction of Middleby's own 3.6 price-to-sales ratio. And that appears to be the problem. Middleby's deal for Aga looks so very tempting that it has now tempted Whirlpool to offer a counterbid for Middleby's target. In a statement released to the public Tuesday, Whirlpool confirmed that it "has made an approach regarding a possible offer" to buy Aga. The company declined to elaborate on "the terms of any offer," however. Indeed, Whirlpool didn't even promise "that a formal offer will be made." And if that sounds to you a bit like a presidential candidate announcing the formation of an exploratory committee to consider whether or not to announce a candidacy -- well, that's what it sounds like to me, too. Whirlpool's "announcement" is so far little more than a monkey wrench tossed into the workings of the Middleby-Aga merger. It also appears to be a wrench that has been casually tossed aside by the intended target. According to Britain's The Telegraph, Aga dismissed Whirlpool's bid as "subject to a number of conditions" and potentially not even "forthcoming" at all. Accordingly, Aga said it still "believes it is in the best interests of Aga shareholders to ensure that the Middleby transaction continues to be executed on the current timetable." Speaking of which, Aga has scheduled a shareholder vote on the merger for Sept. 8 and expects to close on the sale about one week after that, on Sept. 16. So what does all this mean for shareholders? As far as I can tell, it means nothing has really changed. Aga shares (which trade in London) jumped nearly 15% on the apparent interest from Whirlpool. But the company isn't asking for any more money from Middleby. To the contrary, absent a concrete offer from Whirlpool, Aga seems committed to selling itself to Middleby for the agreed price. Well, for close to the agreed price, at least. Press reports have recently noted that in addition to the purchase price per se, Middleby has also agreed to ante up about $54 million to help plug a gap in Aga's employee pension fund. That would seem to make the acquisition a bit more expensive than was initially reported, but not exorbitantly so. At the same time, thanks to the recent turbulence in the stock markets, shares of Middleby itself have come down quite a bit in price since this acquisition was announced. These shares, which cost more than $123 apiece back in mid July, can today be had for just $107 and change. That's a 13% price improvement for new Middleby buyers. Granted, this still leaves Middleby shares selling for the rich valuation of 30 times earnings. But if acquiring Aga boosts Middleby profits by the 25% (or so) that I predicted back in July, the P/E on this stock could soon drop as low as 25 -- with or without a new stock market sell-off. For stock in a company growing profits at 24% annually, and making smart acquisitions at discount prices all along the way, that's actually almost cheap.